Commissioners hold a roundtable about school resource officers at schools Thursday morning inside the BB&T Center. 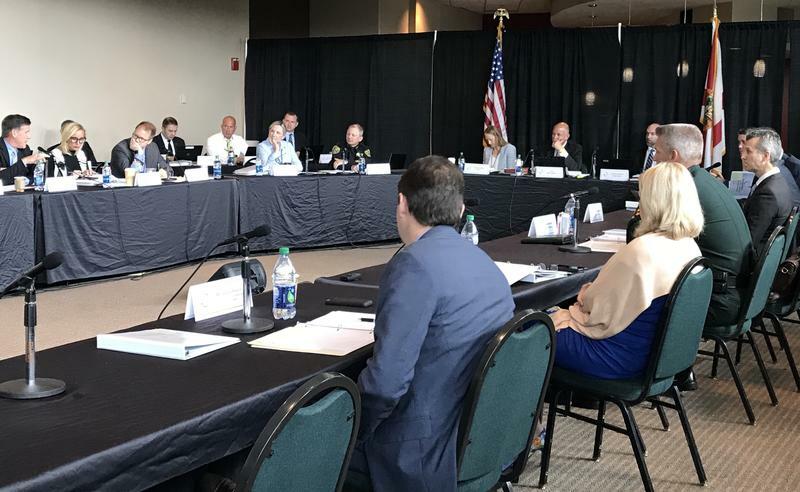 The state's public safety commission is meeting for its second day of meetings this month, at the BB&T Center in Sunrise. 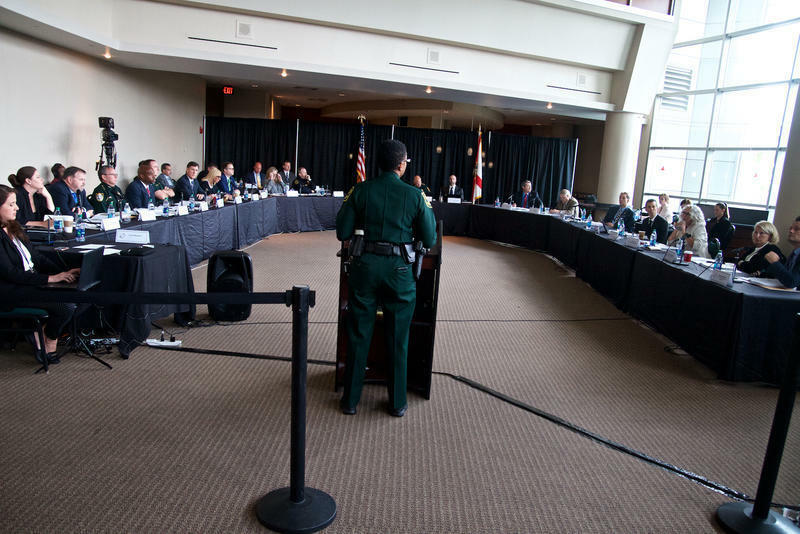 On Wednesday the commission watched a surveillance video showing former Marjory Stoneman Douglas High School SRO Scot Peterson during the February shooting. He did not enter the building where the shooting was taking place. Commissioners announced they had summoned Peterson to testify at next month's meeting. On Thursday the commission discussed standardizing and automizing the threat assessment process for schools across the state. That's the way schools document and keep track of student incidents, including any behavioral issues that could be considered threats. Making that process standardized would include creating sanctions for schools who underreport or misreport incidents. It would also make former students’ reports available to the SRO, in case someone could still pose a threat to a particular school after they leave or graduate, like the confessed shooter in the Stoneman Douglas shooting, Nikolas Cruz. During Wednesday's meetings, commissioners came to the consensus that at least one law enforcement officer should be placed at each middle and high school in the state. There's not enough money, or officers, to place one at each elementary school. However, the elementary schools could have an armed guardian - or someone who is trained and armed by the state - stationed on campus instead of an officer, the commission said. Whether or not armed guardians should be a part of schools' threat assessment teams is still being debated. In between now and the next meeting, on Oct. 10 and 11, commissioners will have to rate possible safety measures for schools, including metal detectors, code red trainings and security camera systems on a scale of one to four. Level one suggestions are considered affordable and able to be implemented quickly; level four ideas are those that are more expensive and would take a longer period of time to put in place. 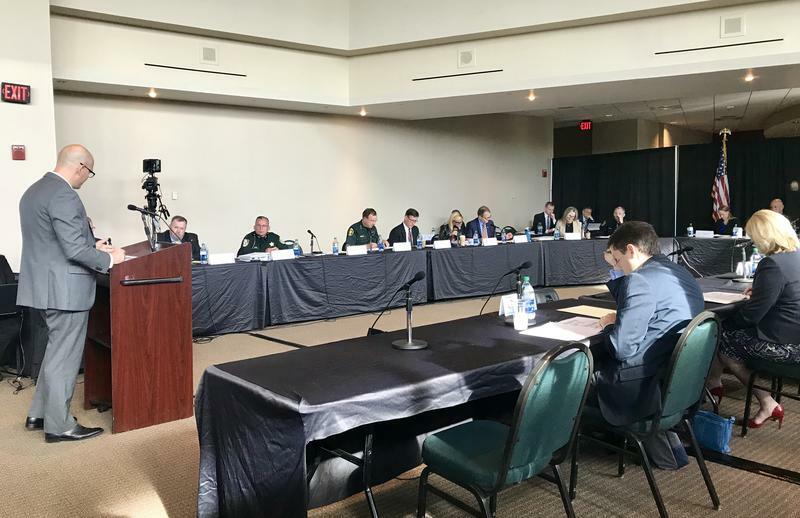 The state commission investigating the Marjory Stoneman Douglas High School shooting is almost ready to make its first round of recommendations for increasing school security and mental health systems. The highly anticipated report from the 14-person panel will act as a statewide guide for schools and law enforcement.